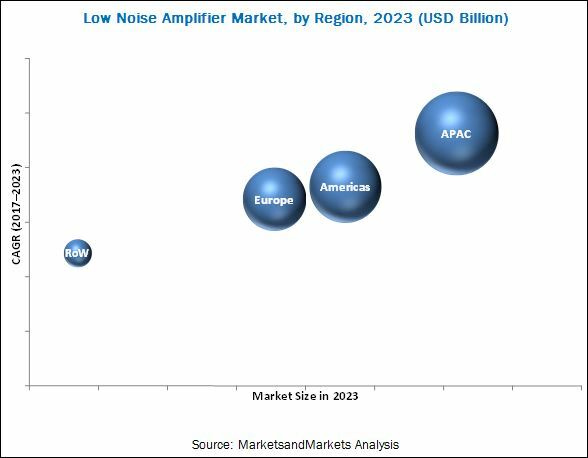 [142 Pages Report] The low noise amplifier (LNA) market is expected to grow from USD 1.17 Billion in 2016 to USD 3.00 Billion by 2023, at a CAGR of 13.8% between 2017 and 2023. This report provides a detailed analysis of the LNA market based on frequency, material, vertical, and geography. The growing demand from the smartphone market, increasing usage of the long-term evolution (LTE) technology, and adoption of E Band to meet growing bandwidth demand are driving the driving factors for the market. 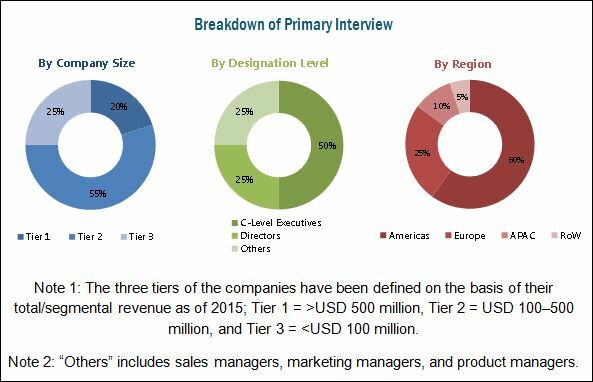 The research methodology used to estimate and forecast the LNA market begins with capturing data on key vendor revenue through secondary sources such as Semiconductor Industry Association, Global Semiconductor Alliance, Electronic Components Industry Association (ECIA), and Semiconductor Portal Inc. Moreover, the vendor offerings are considered to determine the market segmentation. The top-down and bottom-up procedures have been employed in combination to arrive at the overall size of the LNA market on the basis of the revenues of the key players in the market. After arriving at the overall market size, the total market has been split into several segments and subsegments, which have been verified through primary research by conducting extensive interviews with the key officials such as CEOs, VPs, directors, and executives. The market breakdown and data triangulation procedures have been employed to complete the overall market engineering process and arrive at the exact statistics for all segments and subsegments. The breakdown of the profiles of primaries is depicted in the following figure. This report provides valuable insights on the LNA ecosystem including raw material suppliers, LNA manufacturers, system integrators, and end users. The main raw material suppliers include TSMC, Ltd. (Taiwan), Global Foundries Inc. (US), UMC Group (Taiwan), and Tower Semiconductor Ltd. (TowerJazz) (Israel). Some of the major OEMs of the LNA market are Analog Devices Inc. (US), NXP Semiconductors N.V. (Netherlands), Skyworks Solutions, Inc. (US), and Qorvo, Inc. (US), among others. The system integrators include Broadcom Ltd. (US), MACOM Technology Solutions Holdings, Inc. (US), and Microsemi Corp. (US). The end users of the LNA market include Samsung Electronics Co., Ltd. (South Korea), Apple Inc. (US), Audi AG (Germany), General Motors Co. (US), NEC Corp. (Japan), BridgeWave Communications Inc. (US), and Qualcomm Inc. (US). The study answers several questions for the stakeholders, primarily, which market segments to focus on in the next 2–5 years (depends on the range of forecast period) for prioritizing the efforts and investments. Company Profiles: Detailed analysis of the major companies present in the LNA market. The low noise amplifier (LNA) market is expected to grow from USD 1.17 Billion in 2016 to USD 3.00 Billion by 2023, at a CAGR of 13.8% between 2017 and 2023. The drivers for this market are the huge demand from the smartphone market, increasing defense expenditure globally, adoption of E Band to meet growing bandwidth demand, and increasing usage of the long-term evolution (LTE) technology. Among all the major verticals considered for the LNA market study, the consumer electronics vertical held the largest share in 2016. The growth is attributed to the growing adoption of consumer electronics devices such as wearable devices; smartphones, tablets, and laptops; portable navigation devices; portable media players; digital cameras; and gaming consoles; as well as an increase in the number of e-readers. The LNA market for the industrial vertical is expected to grow at the highest CAGR during the forecast period because of the high rate of adoption of Industry 4.0 in the industries worldwide, along with the increasing needs for high-performance portable instruments, and flexible and fast production test systems; and a continuing demand for the highest performance in laboratory instruments. The LNA market for silicon held the largest share in 2016. Silicon devices are typically much cheaper to manufacture. The dielectric constant of silicon devices is high and undergoes minimal changes with a change in temperature. The silicon-based LNAs are used mainly in DC to 6 GHz frequency spectrum, which accounts for the largest share of the overall LNA market based on frequency. The LNA market for silicon germanium is expected to grow at the highest CAGR during the forecast period. The devices based on silicon germanium exceed the performance in low-power, high-frequency applications compared with other materials such as silicon and gallium arsenide. The DC to 6 GHz frequency segment held the largest share LNA market in 2016. This can be attributed to growing demand for smartphones, evolution of LTE technology, and growing demand for wideband-intensive applications. The LNA market for the greater than 60 GHz frequency segment is expected to grow at the highest CAGR between 2017 and 2023. This growth is attributed to the adoption of E band. E band is gaining momentum as an attractive high-capacity solution relevant to mobile carriers due to increasing scarcity of other microwave bands. In terms of the different regions, Asia Pacific (APAC) held the largest share of the LNA market in 2016, and the market in APAC is expected to grow at the highest CAGR during the forecast period. The growth is due to high rate of adoption of smartphones; dramatic shift toward higher speed mobile technology from 3G to 4G; higher increasing range of mobile services consumed, including video, social media, e-commerce, and financial services; and high military expenditures by countries such as China, India, Japan, and South Korea. The LNA market is highly fragmented, which reduces the price margin for the LNA manufacturers. The LNA market has a presence of a number of small- to medium-sized firms. The lower price margin for the LNAs acts a restraint for the growth of this market. Moreover, the increasing competition and cost-driven consumer market have led to price wars, ultimately leading to a reduction in the prices of LNAs. The major players of the LNA market are NXP Semiconductors N.V. (Netherlands), Analog Devices, Inc. (US), Infineon Technologies AG (Germany), L3 Narda-MITEQ (US), Qorvo, Inc. (US), Skyworks Solutions, Inc. (US), ON Semiconductor Corp. (US), Panasonic Corp. (Japan), Texas Instruments, Inc. (US), and Teledyne Microwave Solutions (US). Most of the leading companies have followed the organic strategy of product launches to boost the revenue of the company. Top 25 Companies Analyzed for This Study are - Amplitech, Inc., Analog Devices, Inc., API Technologies Corp., B&Z Technologies, LLC, Broadcom Ltd., Ciao Wireless, Inc., CTT Inc., Custom Mmic Design Services, Inc., Dbwave Technologies Co., Ltd., Infineon Technologies Ag, L3 Narda-Miteq, Macom Technology Solutions Holdings, Inc., Northrop Grumman Corp., Microwave Dynamics, NEC Space Technologies, Ltd., Nxp Semiconductors N.V., on Semiconductor Corp., Panasonic Corp., Qorvo, Inc., Sage Millimeter, Inc., Skyworks Solutions, Inc., Teledyne Microwave Solutions, Texas Instruments Inc., Toshiba Corp., Wantcom Inc.
11.12.1 Custom Mmic Design Services, Inc.
11.12.2 Macom Technology Solutions Holdings, Inc.
11.12.5 Dbwave Technologies Co., Ltd.
*Details on Business Overview, Strength of Service Portfolio, Business Strategy Excellence, Recent Developments Might Not Be Captured in Case of Unlisted Companies.